Complete with 100 real life photographs to stir up your students imaginations! Writing about a topic can be challenging for some of our students. Using the symbol key guide located at the bottom of each card, your students will be self-prompted to generate who, what, where, when and why writing responses. 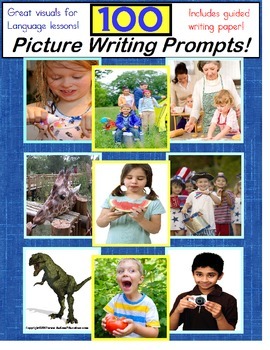 Also wonderful as a Speech and Language activity, it will get your kids thinking, writing, AND talking about the topic! Just print on white card stock paper and laminate if desired for durability. Store in a small box and have readily available for your students to enjoy! A PORTION OF ALL PROCEEDS WILL BE DONATED TO AUTISM SPEAKS! 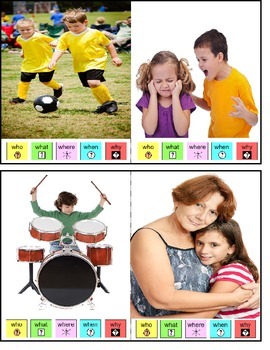 Given a picture prompt and visual support strip, STUDENT will write _____ words indicating who, what, where, when and why, in 4 out of 5 consecutive opportunities, by MONTH, YEAR. Given a picture prompt and visual support strip, STUDENT will write ______ sentences related to the picture responding to who, what, where, when, and why statements. 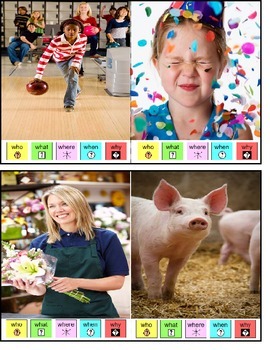 Given a picture prompt and visual support strip, STUDENT will write a paragraph with responses indicating, who, what, where, when and why.